Like many successful celebrities, in 2005, Tom Brady established a charity. Brady’s Change the World Foundation Trust was started as a 501(c)(3) private foundation with an initial contribution of just under $500,000, with all but $10,000 coming from Brady. In the decade since that initial contribution, Brady has contributed nothing to his own foundation, according to publicly available IRS records on GuideStar and the Urban Institute’s National Center for Charitable Statistics. To us, this brings to mind the president’s Donald J. Trump Foundation, another high profile philanthropy named for, controlled by, and identified as the charity of one person while being funded by others. It may be legal, but is it ethical—especially when the celebrity is filthy rich? And, as with Trump, Brady’s charitable and business concerns are uncomfortably linked. The overwhelming source of funding for Brady’s private foundation has been another nonprofit, Best Buddies International. Founded by Anthony K. Shriver, a nephew of President John F. Kennedy, Best Buddies is “the world’s largest organization dedicated to ending the social, physical and economic isolation of the 200 million people with intellectual and developmental disabilities (IDD),” providing “friendship, jobs & leadership development,” according to its website. The charity credits Brady with raising $46.5 million for Best Buddies since 2001. Shriver quoted Brady as saying in 2011, “When I come to Best Buddies events, it’s all about Best Buddies, which is the way I want to keep it while I develop my interests. Would you support helping me pursue my things while I continue to put a lot of energy into your thing?” Best Buddies granted $250,000 to Change the World Foundation Trust in 2011 and increased the amount in subsequent years to $500,000 annually—a practice expected to continue into the foreseeable future. Tom Brady has an estimated net worth of $180 million and his wife has an estimated net worth of $360 million, according to Celebrity Net Worth. Why would the wealthy couple stiff Tom’s own foundation while asking another charity to fund it? And why, until the Boston Globe started asking questions, was it so hard to understand the relationship between Best Buddies, Brady, and his private foundation? By the way, the TB12 Foundation, founded in March of 2015, has filed an interesting 2015 IRS Form 990. According to the foundation’s return, its mission is “To enhance the health, well-being and athletic potential of promising young American amateur athletes by providing access to the ‘TB12 Method’ of athletic training.” Its Schedule L, Business Transactions Involving Interested Persons, notes that “board president, Thomas E P Brady, Jr, is an owner of TB12 LLC, which is the sole member of the corporation” and that “board treasurer/clerk, Jeffrey Surette, is employed as the senior vice president of TB12 LLC.” The foundation has no employees, though Surette was paid compensation of approximately $154,000 in 2015, according to the IRS filing. 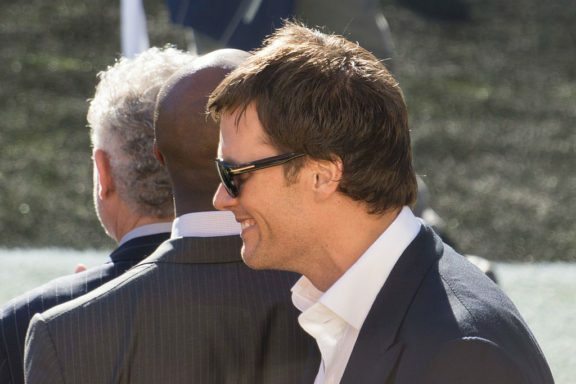 TB12 Foundation’s state filings, including its articles of incorporation and by-laws, may be accessed on the Massachusetts attorney general’s website.